I am a chaperone on a school field trip tomorrow and I am looking forward to accompanying my son's class with the same trepidation I used to feel when I myself was a schoolgirl. 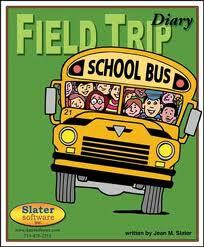 We used to invent field trips as an excuse to avoid the classroom. On one occasion, I asked my father to organize one. I even requested that the class ahead of me be also included because I had a crush on a boy in the 8th grade. I ended up sitting next to him on a very long trip to Jebel Ali to visit the Dubai Aluminum factory. We didn't get off the bus, or perhaps I forgot that detail, but I do remember peering out the window and listening to the engineer-guide. Decades later, my son's teacher inquired on a possible visit to a printing press and I did my utmost to find a good reason for my son to go on a school trip. I contacted a childhood friend, who is the Chief Editor of Canvas magazine and he made our wish come true. I say "our" wish because I accompanied his class on the trip. It was as fun as I remembered school trips to be because all the students were elated to miss classroom instructions! As my daughter jealously remarked, I am not always eager to volunteer for school trips. I haven't been to any of the kindergarten park/zoo visits. I always select the artsy visits and tomorrow's will be at Saadiyat island in AbuDhabi for the Mesapotamia show: a slice of art history I have ignored for too long. With us on the trip, is the fascinating apple crunching teacher, mentioned once upon a blog, in June of 2010!